BrutalMania.io (Brutal Mania) is an online gladiator .io battle game. In which you will fight against a host of other players in the most gruesome fight you will have ever seen. Take on other players and defeat them all to be the last man standing and win the game. You will enter an arena together with other players from around the world. Whack other players with your huge mallet and cause mayhem on a rampage of destruction. There are plenty of upgrades to your characters and their weapons to make you unstoppable in the battlefield. So dominate and destroy all and then jump into another lobby and do it all again! 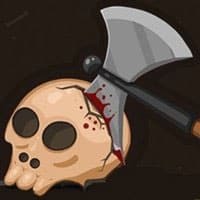 Enjoy and have fun in playing BrutalMania.io Game. Also make sure to check out ZombsRoyale.io Game. You may enjoy playing it. Health system: a player requires several hits before they can be eliminated. A level system to access more upgrades for your weapons and character. Many different characters and weapon appearance. Achievements to earn bonus coins.